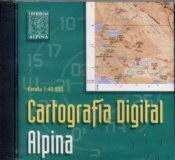 Editorial Alpina maps from Omnimap, the world's leading on-line map store. (Spain) Pyrennees Hiking Maps by Editorial Alpina. The maps cover primarily the Spanish side of the Pyrenees, but each sheet also covers across the border into France and the French approaches. Additional sheets cover other regions of Spain outside of the Pyrenees. These maps are superb hiking/topographic maps at scales of typically 1:40,000. The maps start with topographic maps with 20 meter contours and add hiking trails such as the classic GR 11 hiking route, refuges, camping sites, and hotels. Some maps come with a separate guide. These maps are ideal to accompany the various Cicerone Press guides to the Pyrenees. In Spanish. 65-3280-OR Ordesa and Monte Perdido. (Spain) Val d'Aran CD-ROM. Editorial Alpina. This is a great package that provides a complete virtual visit to the Val d'Aran area. The CD-ROM contains video coverage of 20 routes through the high mountain areas of this popular hiking venue. More than 150 panoramic pictures giving a complete 360º view, 150 photographs, and numerous 3D maps, as well as fully detailed information, make this CD-ROM a very useful guide for nature lovers and hikers. Multilingual, including English. Guía Alpina "Parque Nacional de Ordesa y Monte Perdido". Complete guidebook with more than 30 itineraries, classified in 4 difficulty levels, route maps, altitude outlined profiles and practical information. In Spanish. Cerdanya Guidebook. Complete guidebook with more than 30 itineraries, classified in 4 difficulty levels, route maps, altitude outlined profiles and practical information. (Spain) Mountain Bike Guidebook "Montseny de Ponent". This guide contains seven routes to through western Montseny on mountain bikes. Includes Partial maps, accurate profiles and descriptions on the routes. In Spanish.